If you can close your eyes and visualise a bygone age of juke joints, box car hopping hobos and an air filled with roots inspired travelling music, there might just be a character in the corner mythically known as Woody Pines plying his trade with a solitary resonator and harmonica. This bout of imagery will be enhanced by lending your ear for half an hour to the unashamedly retro sound of RABBITS’ MOTEL, the fourth album by that very person central to your imagination. The delightful Twitter bio for Woody succinctly states ‘American Boogie, Halloween, Viper Jazz and Indi-folk – Nashville, Tennessee’. Well you can add a host of other old time genre classifications to this record, although perhaps the place of residence should just simply state ‘the highways, byways and rail tracks of quintessential USA’. 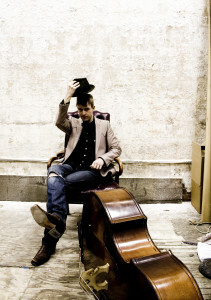 Woody Pines has teamed up with, playing and writing companion, Felix Hatfield to compose eight original numbers leaving two songs the source of that most prolific songwriter ‘Traditional’. Of these two the essential train song makes an appearance in ‘Train that Carried my Gal from Town’ with resonator guitar, upright bass and snare drums providing the motion and harmonica adding functional effect. Piano and clarinet give a jazz feel to the other old number ‘Keep your Hands Off’ in a toe tapping feel good way. On the two tracks Pines shares the credits with Hatfield, the pair have re-visited an early rock n’ roll sound on ‘Addicted to Blood’ while ‘Heartbreaker’ is a more sophisticated number leaning heavily on slow beat instrumental interludes amidst a sad tale of revenge. When composing alone, Pines deals with the transient life in ‘Railroad Vine’ and ‘Hobo and His Bride’, both laid back narrative efforts in true story telling tradition. The boogie induced harmonica drenched ‘Who Told Ya?’ won’t fail to get the extremities of your body moving as does the lively opener ‘Like I Do’ with the immortal line ‘she is putting Vaseline on her skin while drinking gasoline she’s wiping it from her skin’. It is probably these faster tempo numbers that appeal most after considering the merits of this release. Of the remaining tracks ‘I Love the Way My Baby’ is the solitary track which heads in a blues direction while the appropriate album finale sees the pace eased with ‘Close Your Eyes and Dream’. This in effect takes us back to the opening notion of where the eye shut syndrome can send us with a little nostalgic assistance. Back to reality and Woody Pines remain an active band in their native US and on their numerous trips to these shores where they have been exceptionally active north of the border. 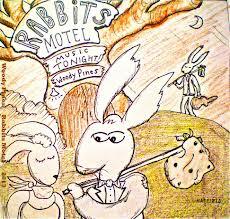 So if you have a desire for a touch of idealistic Americana retro, RABBITS’ Motel is well worth a punt either in your home or in your local juke joint.